Staten Island's former Blissenbach Marina, a contaminated boat yard, sat vacant along Staten Island's north shore waterfront for years, covered in gravel and weeds. The Trust for Public Land, working with the Port Authority of New York and New Jersey, acquired the site in 2004. In 2013, The Trust for Public Land, in partnership with the Port Authority and the New York City Department of Parks and Recreation, remediated the former brownfield and constructed the city's first post-Hurricane Sandy resilient waterfront park. Heritage Park was dedicated in May 2014 by Governor Andrew Cuomo and Mayor Bill de Blasio, who noted the achievement as an extraordinary example of resilient adaptation-and a model for the region. 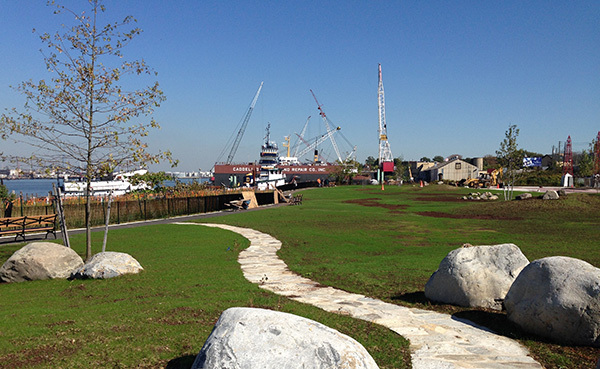 Heritage Park's storm-resilient design now absorbs surges and coastal flooding. Today, the rolling, tree-lined lawn, interspersed with boulders, walking paths, and benches, is perfect for enjoying the dramatic views of Bayonne Bridge and Staten Island's working waterfront.